What dictates your definition of a view depends on, well, your point of view. For some, it’s a mezzanine seat to the Family Barn. Others prefer balcony vistas of fairways and ski slopes. Fortunately, at this home it doesn’t have to be one or the other. Instead, this home has prime seats to both. At the end of a cul de sac, this stunning 6,365-square-foot home with separate guest house has a full view of the Family Barn from one perspective and – on the sunrise side – inspiring panoramas of Lookout Mountain beyond and the 10th and 11th fairways of the Fazio golf course below. Those attributes carry inside where the great room with curved ceiling, bar, wine cooler and a low-slung fireplace enjoy the abundance of south-facing glass and access to a patio with Jacuzzi and built-in barbecue area in a shaded alcove. The kitchen features a large curved counter, abundant storage and intimate breakfast nook. One wing of the home is dedicated to the master bedroom which is adjacent to an office and separated by an artistic fireplace. There’s a deck with private Jacuzzi and views of Northstar’s Lookout Mountain. The other wing leads to two bedrooms with forest views with a custom staircase up to a massive media room with ski slope vistas, large deck and a full bar with sink, refrigerator, and dishwasher. 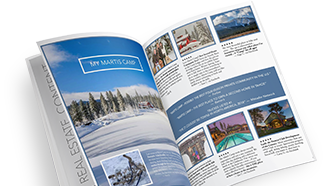 Down the hall is a bunkroom with views to the Family Barn which showcase this coveted location within Martis Camp. Separated by a stretch of mature landscaping is a guesthouse with great room, dining nook, guest kitchen, fireplace and patio.